How do we innovate small, regional, post-industrial cities? In November, I joined a group of colleagues in Oneonta, New York, to facilitate the Innovation Challenge New York (ICNY). Based on the model we developed in Philadelphia at the Fox School of Business’ Center for Design+Innovation, this civic innovation challenge asked students to envision a new future for this small city. This is a video of the civic innovation process at the 2015 Fox DESIGNchallenge in Philadelphia. Students apply design thinking principles to address the question: How can we change our transit system and car culture to achieve the economic, social, and environmental dividends from a less auto-centric future? Oneonta is like many post-industrial cities in the Northeast. They are challenged with declining population, underutilized infrastructure, and a lack of job opportunities and economic growth. Oneonta today is a shell of its more prosperous past. A year earlier, we conducted the first Innovation Challenge NY in Utica, Oneonta’s larger northern neighbor. Like Oneonta, Utica faces similar challenges on a bigger scale. They are part of a pattern of regional cities in decline. However, these 2 cities are seeking to reinvent themselves by tapping into the fierce loyalty, pride and boot-strapping potential of those who remain. They ask themselves the basic question: “How might we use our existing infrastructure, industry, knowledge networks, and history to find new opportunities for economic growth and improved quality of life?" My experience in these cities reminds me of Italo Calvino’s stories in his book “Invisible Cities”. Calvino's "Invisible Cities" are mythical stories recounted by a fictionalized Marco Polo to Kublai Khan about fantastical cities within his empire. Each city has something amazing about it, yet it is unknown to the outside world. Oneonta, Utica, and numerous other small, regional cities are our invisible cities. Each has some fantastic quality that makes it special - waiting to be discovered by an adventurous explorer. In Calvino's story about the trading city Ersilia, he unknowingly outlines the basic format of our civic innovation process. Dissecting the text reveals both the Challenge methodology and reasoning behind it. So, let's analyze the story of Ersilia and discover how to reinvent our own invisible cities. . . In Ersilia, to establish the relationships that sustain the city’s life, the inhabitants stretch strings from the corners of the houses, white or black or gray or black-and-white according to whether they mark a relationship of blood, of trade, authority, agency. When the strings become so numerous that you can no longer pass among them, the inhabitants leave: the houses are dismantled; only the strings and their supports remain. From a mountainside, camping with their household goods, Ersiia’s refugees look at the labyrinth of taut strings and poles that rise in the plain. That is the city of Ersilia still, and they are nothing. They rebuild Ersilia elsewhere. They weave a similar pattern of strings which they would like to be more complex and at the same time more regular than the other. Then they abandon it and take themselves and their houses still farther away. Thus, when traveling in the territory of Ersilia, you come upon the ruins of the abandoned cities, without the walls which do not last, without the bones of the dead which the wind rolls away: spiderwebs of intricate relationships seeking a form. The first step of the process is immersion and data collection. This is a physical approach to problem solving and requires hands-on fieldwork in the city itself. Rather than discussing problems from the safe confines of a conference room, this approach engages issues firsthand. One must be like Calvino's Marco Polo and explore the city's fabric to discover hidden challenges and opportunities. This involves observation by walking the city and interviews with stakeholders. The second step is abstraction and analysis. After immersion, it is important to step away. What are the underlying patterns? Is there a hidden logic? Abstraction through drawing, diagramming, and mapping enables participants to strip away the surfaces and superficial structures to find their underlying relationships and the root causes of problems. The goal is to break down complex information into more understandable basic elements that can be categorized and clustered to find relationships. Like the inhabitants of Ersilia, participants seek to order the information of the city. Although this phase is still exploratory and reliant upon trial-and-error to find the best tools, this type of analysis is methodical and rigorous. A typical method we use is Storytelling and Note-taking with Post-it notes. This transcribes personal accounts and experiences into building blocks which can be combined into meaningful insights about the city. Another method is illustrated in the portrait of South Philadelphia shown above. 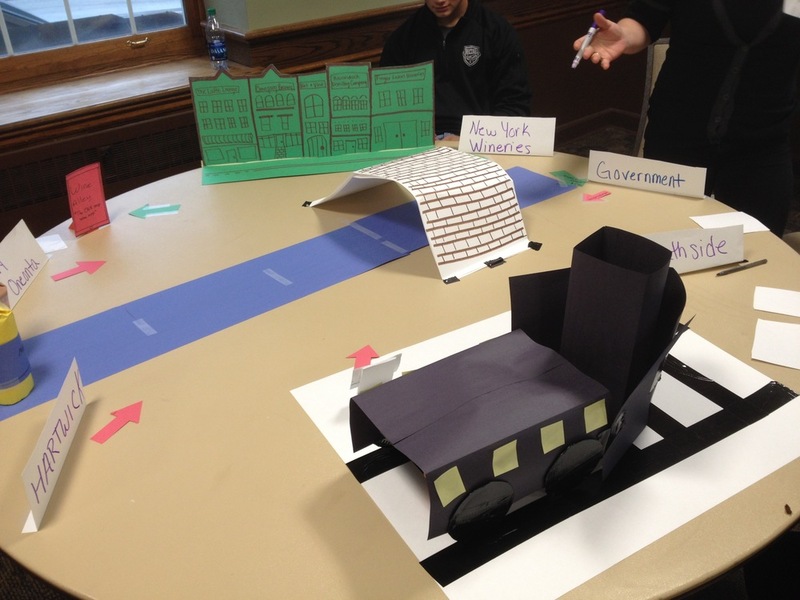 In this model, participants create visual representations of their city and use strings to connect all of the related qualities, institutions and organizations. As in Ersilia, these abstract representations are a form of the city itself, a clearly defined network of relationships laid bare. Regardless of the method, the goal is to make the relationships more evident and use this information to synthesize meaningful insights and opportunities for change. Once the city is abstracted and analyzed, the next step is to recognize patterns within the information and identify opportunities for change. These are Calvino's "spiderwebs of intricate relationships seeking a form . . ."
No problem exists in isolation. In this phase, connections are made among existing conditions, competing forces and influences and unmet user needs. The city is viewed as a system. Within this system, what is needed and not being provided? Where are the gaps? Where are the successes? Where are the most significant intersections? Often, it is helpful to distill insights into a "Big Idea" which can be used as a catalyst to generate many solutions. Once the opportunities are identified, ideas are generated through brainstorming sessions to propose potential solutions. This is again an iterative process and includes trial-and-error. Numerous ideas are made visible through diagrams and modeling. Each is a rebuilding of the city in an improved form. Once an idea is explored, it is important to quickly move onto a new idea - each pushing the potential solutions farther away from what is known, obvious or expected and further toward what is surprising, challenging and innovative. The best qualities of each proposal are consolidated and combined into a final proposal. The last step in the process is presenting the ideas to the group. In this stage, ideas are shared, critiqued, questions are raised and initial feedback is provided. Depending on the situation, this can either be the end of the process or the beginning of a new round of consolidation, development and refinement. In Oneonta, we all recognized that the 9 student teams in the initial round produced 9 strong ideas that need another round of development. The next step will be to build on these proposals by combining related ideas and developing the most promising directions. In this second round, we also recognize that it is time to bring more people in positions of authority into the process. Again, Calvino unknowingly provides the answer. In Ersilia, it is the inhabitants of the city who engage in the process of building, analysis, reflection and rebuilding. For our invisible cities to rebuild themselves, meaningful change has to be envisioned within the community itself. Oneonta's small size and civic-minded inhabitants make it a perfect test case. In the Spring, we plan to return for another session where civic leaders - political, economic and cultural - take the ideas proposed by the students and work as a team to make them better. At the end of this phase, the next step will be to make it real. Special thanks go to Carolyn Lewis / SUNY Oneonta, Robert Edgell / SUNY Polytechnic Institute and Carli Ficano / Hartwick College for making the Challenge in Oneonta possible.